All pets should be in stable, loving homes where they are thought of as a beloved member of the family. Spay/neuter is the ONLY answer to the pet overpopulation problem. We strive to find the best possible match for the pets in our care. They will live with us until they are adopted. In order to match our pets with their perfect owner, we undergo a relatively thorough background check during our adoption process. This includes a vet reference, as well as various questions regarding their future home life (fenced back yard? any other pets or small children? etc.) We will ask you some basic questions over the phone to assure compatibility and to better understand just what you're looking for. That way we can match you with a pet that best suits your needs as well as theirs. From there, we will set up a "meet 'n greet," so you can spend some time with the prospective pet, and get to know him/her more intimately. No pet will go home with its new owner on the same day, however. We will do a home delivery, and if needed, you can borrow some basic supplies to get you started (i.e. pet crate, dog food, leash/collar, etc.)! We strive to place our pets in a home that best matches their needs. If any of our furry friends peek your interest, please contact us right away! 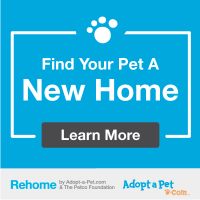 Browse through our lovable pets today, take some time to read their stories, and you too could find your new forever friend! Fill out form and press Enter to submit!